1. Yes, there has been inflation since the 1960s, which erodes the value of the minimum wage. 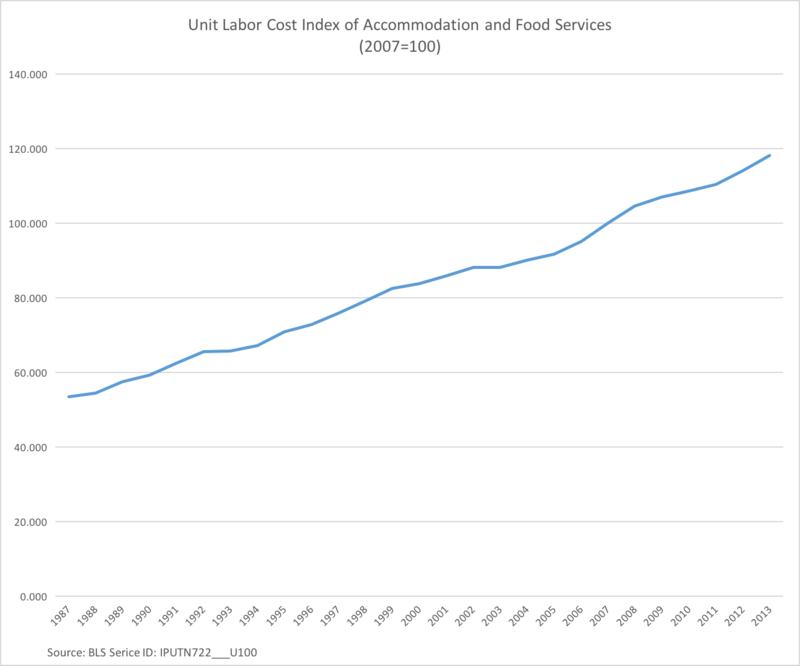 Which side of this debate generally supports inflationary monetary policy?… Also, the productivity in the whole economy has increased, but not in the accommodations and food services sectors. In those sectors, the cost of labor has been outpacing productivity. See graph. 3. I’ve heard this a lot lately, and it is completely backwards. When we subsidize the poor through those programs, we make not working a better alternative use of their time than before. This pushes wages HIGHER, since employers now have to compete with that better alternative. This doesn’t mean that we should balloon the welfare state, but if you are intent on helping the poor through government, programs like the EITC are a better less economically damaging way to do that. 6. So, because Republicans will push for a lower-than-$10.10 minimum wage, Democrats should go for the higher $15.00 to compensate… which will ultimately give us 10.10? I though Reich supported a higher minimum wage than that. Shouldn’t he advocate for $19.90 so he can get what he really wants after the GOP forces a compromise? 7. If raising the minimum wage to $15.00 is right, wouldn’t raising it to $30.00 be even more right? If Reich thinks that’s a good idea, he more obviously reveals himself as an economic dunce. If, however, he responds that doing so would be economically infeasible, which it is, then he is saying that economics trumps morality. But if economics trumps morality, why is he even bringing this up as one of his seven points? This entry was posted in Economics and tagged business, company, low, low wage, minimum wage, profit, robert reich, skill, skilled, wage on May 27, 2015 by Jacob Fishbeck.